This particular Don Quixote was just one of many paintings on this theme that Daumier produced. Towards the end of his life, as he was facing the prospect of his own mortality and going blind, he became increasingly preoccupied with the story of a man whose delusions of grandeur led him to battle windmills, whose sense of adventure led him into contact with people from all walks of life. The radical message contained in Don Quixote, that a person's social status did not automatically determine their worth - that in fact, some people from the upper-class were downright scoundrels - must have greatly appealed to a social and political satirist like Daumier. 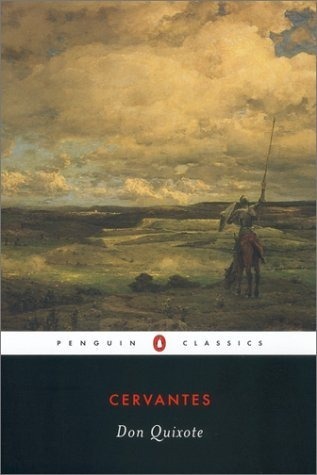 The quest for adventure and meaning that pervades Don Quixote has been termed an apt metaphor for the dilemma of the modern man. Many of Daumier's artistic contemporaries were inspired by this tale. However, Daumier's Don Quixote series bears little resemblance to other artists' interpretations of the novel. This is partially because he soon abandoned the narrative of the scenes for pure symbolism. Daumier the artist became Daumier the writer and transformed Cervante's brilliant mythology into his own. Daumier was particularly entranced by the dynamic between Don Quixote, the delusional dreamer, and Sancho Panza, his simple but practical sidekick. It is unsurprising that this particular dynamic would appeal to Daumier, a man who was a populist entertainer in his cartoons but showed deep philosophical leanings in his paintings. In Daumier's later drawings such as this one, Don Quixote increasingly appears by himself. Scholars have proposed that Sancho Panza is not absent, but rather that the two archetypes have merged into one character. Perhaps Daumier was signaling the integration of the two sides of his personalitythe cartoonist and the philosopher. In this depiction, steep slopes often appear which can be interpreted as a symbol for obstacles. 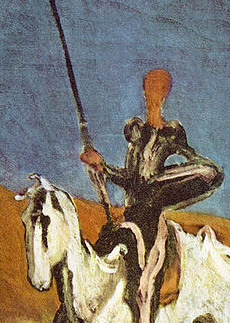 In Don Quixote, the mountain appears behind the rider. However, it is unclear whether Don Quixote has just climbed the mountain or is about to face another one - perhaps it is both. From the body language of the rider, along with his upturned lance, it appears as if he is off to some conquest. Most significantly, Daumier depicted Don Quixote without his hat, something he rarely did in his Don Quixote series. However, the hat was actually an upturned bowl that he had deluded himself into thinking was the hat of Mambrino. Being bareheaded, therefore, signifies that Don Quixote goes off into the distance without pretensions. As Daumier progressed in his later works, his paintings became increasingly Impressionist, suggesting rather than completely showing. Daumier presents the essence of the scene, rather than the scene itself, to make it a more powerful and distilled version of itself. This abstractness is partially due to Daumier's fading vision. But the symbolism of a rider steeling himself to charge boldly forward into the unseen distance must have been a powerful one for a man facing both blindness and looming death.